Gaige Garcia couldn’t have scripted it much better. 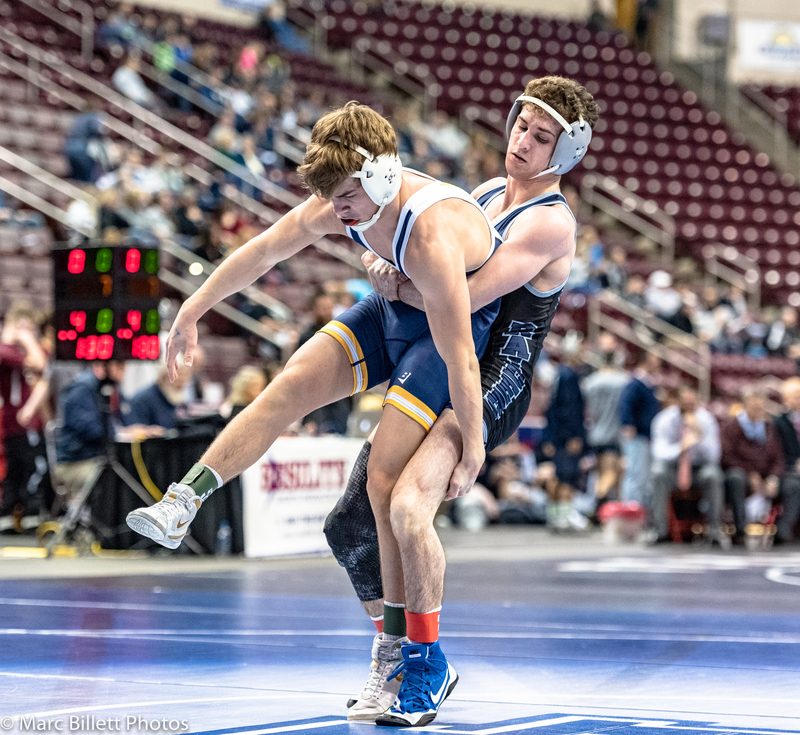 The Southern Columbia junior picked up his 100th career victory on Friday night with a fall that clinched a spot in the final of the PIAA Class 2A Team Wrestling Championships. Well, maybe it could have been sweeter if it had come in the final against top-ranked Reynolds. The championship match, which starts at 1 p.m. at the Giant Center, is a rematch of last year’s title match, which the Raiders won 30-25. Reynolds will provide a formidable challenge for the second-ranked Tigers, who got a scare from No. 6 Chestnut Ridge on Friday night. The Lions led 16-6 after six bouts in a dual that started at 106, but Gavin Garcia, Shane Miller and Cade Linn needed just 131 seconds of mat time to turn that deficit into a 24-16 lead, as they strung three first-period pins together in a critical run from 145 through 160. Chestnut Ridge battled back to take a 25-24 lead, but Preston Zachman’s major decision over Brodie Harbaugh at 195 put Southern Columbia ahead, and Garcia – who is ranked second at 195 – bumped up to 220 and pinned No. 12 Duane Knisely, then gestured toward the strong Southern Columbia contingent in the stands. Saturday could bring an even better feeling – if the Tigers can find a way past Reynolds. That’s a big if. While Southern Columbia was struggling with Chestnut Ridge, the Raiders were pounding third-ranked Saucon Valley, 46-20. Reynolds needed a little more than four minutes of mat time to seize a 24-0 lead over a shellshocked Saucon Valley that was 20-0 entering the night but wrestled without several starters. Gary Steen, Cole Bayless, Beau Bayless and Andrew Ischo put their team in the driver’s seat and the Raiders never looked back. Joshua Jones got the Panthers on the board with a tech fall at 132, and Thomas Spirk and Nicholas Rosengrant followed with decisions that cut the deficit to 13, but that’s as close as the District 11 champions could get. Reynolds, which has won 66 of its past 67 dual meets – including back-to-back PIAA titles – strung together four more victories by Rocco Bartolo, Hunter Thompson, Cole Toy and Bryce McCloskey to end any thoughts of a comeback.